You never forget the first time you spent a night alone with the girl of your dreams. You couldn’t imagine staring at something more intently than the way you stare into her eyes in between soft, subtle kisses as you lie together, blanketed in nothing but moonlight. Nothing could make you more content than to be next to her forever but you have only until morning to bask in her embrace. You try your damnedest to keep that fact furthest from your mind as time gets away from you. The moon begins to withdraw as the sun gradually creeps in to coax the day’s progression. You don’t want to say the wrong things but you know you can’t say nothing at all. At the last possible moment, softly stuttered syllables barely escape your nervous lips with bated breath. You clumsily make out fragments of the words you wish to, and luckily they’re just enough. She gets them… and she loves them. They’re everything she wanted to hear. Each play-through of Purity Ring’s debut has left me feeling as though I had once again experienced a first night with that special girl. Shrines is the intimacy of the setting and the perfectly whispered fragments of words that reach their destination with impact and impeccable timing. At a brief thirty-eight and a half minutes shared between eleven tracks, Shrines nestles nicely into comfortable top-notch production and deep, bass-induced lullabies, likely to be prized by the common club-goer. The beats throughout Shrines would intimidate even hip-hop’s heaviest hitters, forming a marriage with a recurring theme throughout that ostensibly alludes to grotesque imagery involving organs, bones, body parts, and the evisceration of such, and as these seemingly macabre lyrics may come off as unsettling to some, they evoke a beautifully ethereal tone within the whole of Purity Ring’s effort much like a garland of conceptual prose. In the second track (my personal favorite), “Fineshrine,” vocalist Megan James sings, “Cut open my sternum and pull… my little ribs around you,” as the aforementioned theme begins to truly set in with ritualistic imagery that breaches Shrines‘ surface continually throughout. 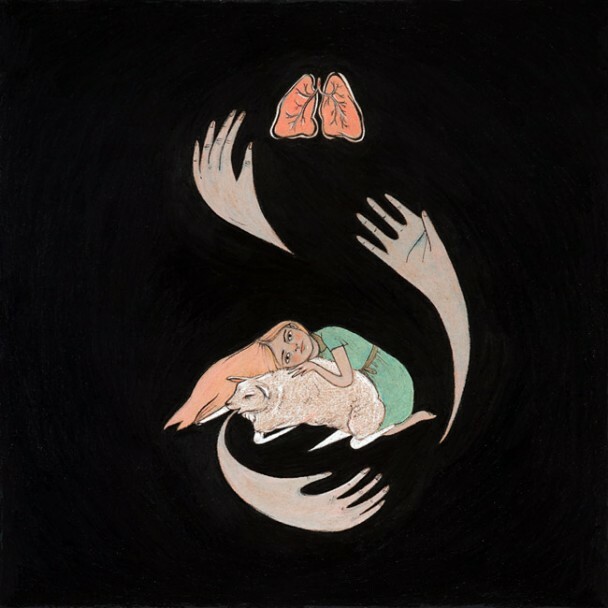 Accompanied by one of the better rhythms on the album, I’d say that “Fineshrine” is the most accessible track to represent Purity Ring’s sound overall. Nearly six and a half minutes after the closing of “Fineshrine,” you find yourself at a more unique (and in my opinion) ambitious offering from Purity Ring that they’ve managed to execute perfectly; “Grandloves” is the fifth track on the effort; a sensual slow jam reminiscent of a piece you’d find somewhere in The Weeknd’s mixtape trilogy. A vocal contribution from Abel Tesfaye would have fit seamlessly and I personally would love to hear such a cameo if Purity Ring are to continue this angle in the future. Creeping in slowly with fluttering hi-hat and fade-ins of chamber choir vocals, “Cartographist” immediately follows the flow of “Grandloves” to slow things even a bit further. It’s a hypnotic hump-day, somniferous in its approach as it makes you feel as though you’re sleepwalking backwards through the creepy tunnel scene in Willy Wonka and the Chocolate Factory. You know the one. “Shuck” is the shortest and final track on the album beginning with nearly nothing but eerily uttered vocals from James, staying true to her lyrical pursuit found evident on Shrines. “When the moon is full and eyes bright, I’ll take up your guts to the little shed outside. I’ll shuck all the light from my skin and I’ll hide it in you.” With echoed bits and pieces of James’ words, a slow, thick beat comes in with beautiful background of buzzy synth notes like samples from the Twin Peaks theme; creepy but satisfying. Purity Ring have given birth to 2012’s most impressive debut. With Shrines being the outfit’s first LP release after only two short years as a partnership, I think it’s safe to assume that competition for their future efforts will be next to none. Now, every single moment until the next time you see her will be spent in distracted, agonizing anticipation. Love Purity Ring, but I hate that you brought Abel Tesfaye into this review. Purity Ring is so above his lackluster songwriting that focuses on the same topics we hear from every billboard top 40 song. The only good album he put out was house of balloons- the rest have been total crap. Otherwise, well written. Looking forward to this album.